Famously made into a Paul Newman film in 1982, Barry Reed’s book is here adapted for the stage by Margaret May Hobbs. There is a strong affinity between the law court and the theatre, because of the rituals, the adversarial nature of the lawyers, and the potential for surprise. The first act is split mainly between Frank Galvin’s shabby office and Meehan’s Irish bar in Boston, with the odd scene in Galvin’s rival’s office and a judge’s chambers, all presented on a sturdy, detailed set designed by Michael Lunney. The set adds weight to the drama and, along with the convincing accents of the cast, gives the piece an authentic tone. As plucky attorney, Frank Galvin, Ian Kelsey is eminently watchable, wearing the role like a pair of comfortable old shoes. Drinking incessantly, it seems, and viewing the world through Jameson’s-tinted glasses, he is the decent man, standing up for the helpless (in this instance, a young mother reduced to a persistent vegetative state by alleged medical neglect). Assisting him is his mentor, the irascible Moe Katz, played by the ever-excellent Denis Lill. Christopher Ettridge also impresses as the big bad lawyer, defending the hospital and the church dioceses that runs it. As does Richard Walsh as Bishop Brophy, who rounds out a potentially villainous role with humanity. It’s a large and strong cast with pleasing character work from the likes of Anne Kavanagh as the victim’s mother, Michael Lunney as genial bartender Eugene, and Okon Jones in a hugely enjoyable portrayal of expert witness Lionel B Thompson. Paul Opacic is suitably suave and assured as flashy doctor Rexford Towler, and there is a striking cameo from Karen Drury as Nurse Mary Rooney. It’s a wordy piece but is so compellingly played you hardly notice the lengthy running time. It’s a slow-burner, gradually establishing the background of the case, leading up to a trial scene that does not disappoint. Michael Lunney’s (that name again!) direction paces the action superbly, so that when the shocks and revelations come, he elicits gasps and murmurs from the enrapt audience. This high-quality production rewards the attentive audience – and, on a side-note, it also serves as a stark reminder that our American cousins have to pay exorbitant sums for their health care, a sorry state of affairs we must not allow to become the case here, as some in our present government would wish. Jack (aka C. S. Lewis to you and me) is a confirmed bachelor, a middle-aged don lecturing at Oxford about pain and suffering being God’s way of showing us he loves us. Something along those lines, anyway. The lecture, which opens the show, brings to mind the old saw, “Those who can’t, teach”. Indeed, it’s not long before old Jack learns the harsh lesson that experience is vastly different from theory, or indeed theology. Into his stuffy male world amid the hallowed halls of academia, comes American Joy Gresham. They correspond by post initially until she suggests they meet for tea. A friendship is engendered, which develops into something more, bringing Jack into real contact with the pain and suffering he has been banging on about. This touring show by the excellent Birdsong Productions is supremely enjoyable. William Nicholson’s charming and witty script is brought to sparkling life; director Alastair Whatley knows when to temper the British reserve of the characters with glimpses of emotion. Often, the understated moments are the most striking. Stephen Boxer makes Jack a likeable figure, as we watch him thaw and take tentative steps toward expressing his feelings, gradually winkled out of his shell. We urge him on and it is touching to see the progress he makes. Amanda Ryan as Joy is the chalk to his cheese, but their differences are mainly on the surface. She is very much his intellectual equal, someone to stir him out of his stagnation. The dialogue sparks between them and, perhaps surprisingly, the laughs keep coming despite some difficult subject matter. Even with a terminal illness, she is funny. The humour binds the couple and endears them to us. Denis Lill, for me, almost steals the show as Jack’s lovably gruff brother Warnie. British reserve has rarely been more eloquent. Simon Shackleton also makes a strong impression as boorish Professor Riley, offering an atheistic counterpoint to Jack’s faith, while Shannon Rewcroft dons schoolboy blazer and short trousers for a convincing portrayal of Joy’s eight-year-old son. It’s an entertaining, amusing and absorbing tale of love and loss, superbly presented. Poignant without mawkishness or sentimentality, it shows us that Romeo and Juliet are not the only star-cross’d lovers that can break our hearts and, while it’s based on a couple from real life, shows us the universals in their story, examining notions of pain, suffering and what we mean by ‘love’. Reginald Rose’s superlative play continues to do the rounds and I am delighted to have the chance to see the production again with a new cast. So intriguing and engaging is the writing that it doesn’t matter a jot if you’ve seen it before and know the outcome – any decent production of The Merchant of Venice can still get a lot of mileage out of its famous trial scene, and this production is no different. And, of course, if you haven’t seen it, you’re in for a treat and a half. A jury is sequestered in a room on the hottest day of the year to deliberate their verdict in what seems like a straightforward murder case. A unanimous verdict either way is required. Eleven vote guilty but one lone voice dissents. This is Juror 8 played with calm assertiveness by Jason Merrells. Merrells is the morals of the piece, chipping away at the presumptions and prejudices of his fellow jurors, gradually winning them over to his way of thinking. It is no accident that designer Michael Pavelka puts him in a white suit. It’s subtle symbolism in a muted colour palette and a thoroughly naturalistic production. The set is evocative of place and weather conditions. The master stroke is the large table around which the jurors all gather from time to time. It’s on a revolve, moving imperceptibly so that our viewpoint is forever changing. The table, as well as the tables, is turned! Director Christopher Haydon choreographs the actors so that the stage is never static, while maintaining a naturalistic air to their behaviours. Of those jurors – all of whom do a grand job – those that stand out for me are Denis Lill as an irascible racist loudmouth, Gareth David-Lloyd as a glib advertising executive, Alexander Forsyth as the youngest of the bunch, and Paul Beech as the eldest. Robert Duncan is a counterpoint to Merrells, but it is Andrew Lancel as Juror 3 who provides the emotional punch of the evening as the hothead with his own personal agenda. An electrifying couple of hours that has you gripped from start to finish, it’s also amusing and thought-provoking, reminding us in these dark days of hanging fan Michael Gove as Minister for Justice, that once you carry out a death sentence, there is no going back. Director Joe Harmston has put together a company of actors, many of whom are familiar from his productions of Agatha Christie plays, and brings out a different side to them in this delightfully silly show, loosely based on an old Bram Stoker story, The Jewel Of The Seven Stars. From the start, you know you’re in for a treat as Jason Durr narrates the back story, accompanied by some hilariously low-tech projections and shadow play. Jack Milner’s script reminds me of the golden age of radio comedy with its wordplay and double talk, complemented by much on-stage comic business of Harmston’s devising. The laughs keep coming. It’s not perfect: the quick fire gags are hit-and-miss and the pacing flags a little in the first act. The audience participation that greets us when we’ve come back from the bar for the second act is needed earlier on – especially since the curtain up was delayed by quarter of an hour due to a technical hitch; we needed warming-up by then. The second act tears along relentlessly and consistently daft. On the whole, it’s a laugh-out-loud romp, played to the hilt by a very funny ensemble. Denis Lill is spkendidly crazed as the Egyptologist on a mission – as well as a couple of other roles – Jason Durr, the heroic lawyer with his eye on Lill’s daughter (there is a dancing scene that ensures I will never regard Durr in the same light) and David Partridge is very funny as bonkers explorer Corbeck. Andrew Bone makes the most of his role as Inspector Doolan. There is much fun to be had with doubling of roles and dummies but for me the revelation of the night is the beautiful Susie Amy, vamping it up and camping it up as the Professor’s daughter and the reincarnated Egyptian princess. I hope she does more comedy in the future. Dean Rehman’s immortal high priest Sosra is a deliciously evil (and hilarious) creation – I shan’t forget the eye-pulling scene in a hurry. It’s a great-looking show too. Sean Cavanagh’s set design is almost like a toy theatre; scenes are wheeled on and off on trucks by stagehands dressed as workmen, keeping things moving and allowing for some very funny exits and entrances. Ben Cracknell’s lighting casts a nostalgic glow over the proceedings, the soft haze of an old film. 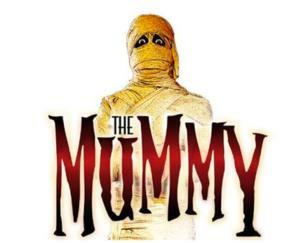 The Mummy is an old-fashioned slice of British silliness, clever and stupid at the same time, a celebration of artifice and theatricality while sending up its own form. Most of the pleasure in these murder-mystery shows comes from trying to out-think the writer and work out what’s happened, sometimes even before it happens. When you see an Agatha Christie, you have to keep your wits about you, Poirot fashion, and more often than not, you don’t see it coming. Unlike in our own cosmically insignificant lives, in an Agatha Christie, everything happens for a reason. Even if it is a red herring to lead us up the garden path (and make us mix our metaphors), every detail has purpose and we are invited to sift through them and play the game. Or, you can sit there and let it all wash over you, until the denouement. 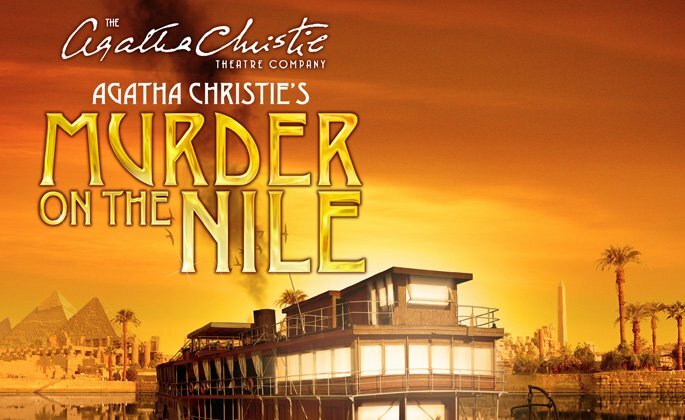 The Agatha Christie Theatre Company churns out these productions year after year and usually they are very gripping affairs. Sadly, this one is such a slow burner it doesn’t really create any atmosphere until the second half. By the interval, no one was dead – when “murder” is in the title, it’s all you’re waiting for. It’s all Titanic and no iceberg. We are introduced to the usual mixed bag of characters. Kate O’Mara totters around the deck as objectionable old snob, Miss ffoliot-ffoulkes. After ten minutes I was ready to climb out of my seat and throttle the old bag, so effective was O’Mara’s portrayal. She doesn’t miss a beat and provides most of the comic relief. Also on board are Christie stalwarts Mark Wynter as foreign (and therefore suspicious) Dr Bessner, Chloe Newsome as unhinged stalker Jacqueline de Severac, and dependable old Denis Lill as Canon Pennefather, a cleric who finds himself playing detective when the murders eventually take place. Impossibly beautiful Susie Amy drawls through her dialogue, while Vanessa Morley as her French maid Louise, glowers and frowns like a double agent in ‘Allo, ‘Allo. Ben Nealon conveys intensity as social-climbing gold-digger Simon Mostyn. Jennifer Bryden gains our sympathy as the decent, put-upon niece to O’Mara’s harridan aunt and Sydney Smith provides grinning support as the steward on this seriously understaffed boat. Additional local colour is supplied by Hambi Pappas as a persistent and annoying purveyor of souvenirs. Outbursts from the dapper young Communist-with-a-secret, William Smith (Max Hutchinson) could have been written yesterday: the continuing exploitation of the poor by the rich, how the judicial system treats people according to class… Set against a backdrop of Egyptian unrest, this makes Christie seem startlingly prescient. The world hasn’t really moved on since the play first appeared in 1944 – or if it has, it has since taken backward steps. A sweltering evening in Wolverhampton matched the onstage setting, adding to the atmosphere. I would have preferred more action in first half as I sat there wilting, but on the whole, director Joe Harmston, an old hand at this type of thing, handles the material well, conspiring with Christie to surprise the audience. Moments of action and revelation are tackled very effectively. I worked out what was going on with the Communist but was pleased to be put in my place when whodunit was finally revealed. Turns out I’m no Miss Marple after all. The ambiguous ending means the story stays with you after the curtain falls and the genius of Agatha Christie has asserted itself yet again.